Bill Murray, Endless Loops, & The Groundhog. Groundhog Day. 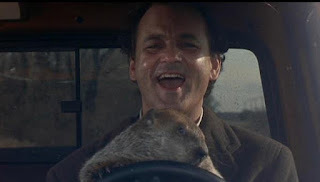 Such an odd and silly little holiday when you think about it, and one that is now synonymous with the movie starring Bill Murray, where he gets stuck repeating one endless day. When the movie came out it was considered a modest hit, but over the years something changed, and people started to look at it as perhaps a kind of masterpiece. Buddhists celebrate the film as a metaphor for many of their teachings. Prominent Catholics commented on the movie as being representative of the concept of purgatory. Beyond the commentary from these lofty places, nearly every one you speak to can relate to this movie in one way or another. “Taking Forever” is his response. An odd footnote to this movie is that former best buddies and collaborators Bill Murray and Harold Ramis had a parting of the ways after the movie was done filming. Murray thought the movie should have been more philosophical in nature, and Ramis thought it should be a comedy. It might seem like a small thing for two such brilliant friends to be fighting about. It wasn’t to them. They didn’t speak again for twelve years. To me their argument speaks to the very premise of feeling stuck in this life, right to its very core. Fr. Alfred D’Souza weighs in on the side of life as the philosophical tragedy, saying, “For a long time it had seemed to me that life was about to begin, real life. But there was always some obstacle in the way. Something to be got through first, some unfinished business, time still to be served, a debt to be paid. Then life would begin. At last it dawned on me that these obstacles were my life." So what does all of this have to do with Groundhog Day? Perhaps the answer lies in how Murray finally breaks free from the endless loop, as it slowly dawns on him that he is never going to escape. He surrenders to his fate, while also oddly becoming a wonderful source of inspiration to his fellow captives. By directing his energy away from himself and more towards others, he begins to feel a kind of emotional freedom, despite the fact that he feels like he will be stuck forever in the same day. Why would he do this? If there is no accountability, shouldn’t we just make ourselves happy and take whatever it is we want from life? People seem to voice this opinion often, and Murray in the movie also first takes this approach. It doesn’t seem to work for him. Or for most lottery winners. They’re usually broke again in a few years. So maybe it is really as simple as the movie makes it seem. If we all have felt stuck in our lives, and we’re all here together, then it stands to reason that we could at least help each other carry the weight of these feelings. Self-absorption as a response to feeling stuck often feels like the right way to go, when in fact it’s like spinning our tires deeper into the quicksand. When we chose to give instead of get, we often get back much more than we ever could have expected. And what we get back is not simply quid-pro-quo, but instead something much more powerful, which is freedom from the little prisons of self-obsession we build in our own minds. And really, that’s the only kind of freedom that matters.